The American Association of Orthodontists recommends that all children receive an early evaluation by a trained orthodontic specialist at age 7. The reason for this is that an orthodontist will be able to identify potential orthodontic issues before they have a chance to become serious problems. An early evaluation isn’t the same as early treatment, however. The evaluation simply allows your orthodontist the chance to evaluate your child and make a recommendation as to whether your child would benefit from early treatment or whether it is fine to wait until all your child’s adult teeth have erupted. At Coastline Orthodontics, our orthodontists believe in providing not just the best orthodontic care possible, but the right care for each patient’s individual needs. In the case of pediatric patients, this means that your Coastline orthodontist will always carefully examine your child and will only recommend orthodontic treatment that he or she truly believes would save your child from needing more significant treatment later in life. The majority of parents who bring their child to our office for an early evaluation get to return home with the comfort of knowing their child does not need treatment. For the few patients to whom we do recommend early treatment, they will benefit from our extensive expertise and strong dedication to the comfort and needs of those in our care. 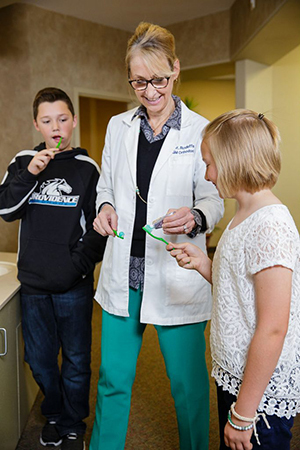 If you are interested in having your child evaluated for early treatment, you can take advantage of our free Coastline Orthodontics Smile Assessment. Simply call us at 904.751.6030 or click here to schedule an appointment today. We look forward to hearing from you!